Freedom to express, especially on social media, is being questioned again. the news of superstar Amitabh Bachchan's death has shocked the social media. This news about passing away of the legendary star is going viral on Facebook with a collage of photos. 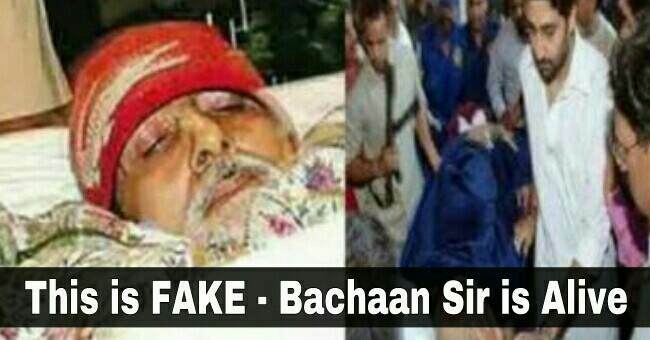 The pictures show that Big B is lying on a stretcher, while son Abhishek is rushing him to a hospital.Last year, the fake news about his death had gone viral on WhatsApp. Earlier, a fake story about Aishwarya's suicide had shocked the fans of Bachchan family. The fake WhatsApp message of Feb 23, 2016, went like this-“At about 11 a.m.
We would like to assure Big B fans that he is hale and hearty. Like most of the fake news, this too may originated in Pakistan.